The Ohio State men’s basketball team has had its notable struggles this season, but after two straight wins against Michigan State and stealing one at the buzzer at Nebraska, there was a reason for optimism. The Buckeyes had a real chance at turning an 0-4 start to Big Ten play into 4-4 with two winnable games at home after Nebraska. 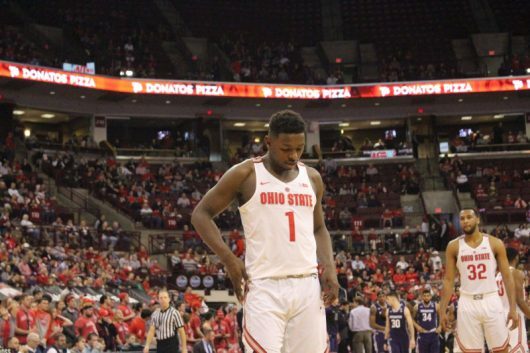 Alas, OSU’s 74-72 loss at home on Sunday to Northwestern can be attributed to a lack of focus on the team, according to Buckeyes’ center Trevor Thompson said. The redshirt junior has been OSU’s most consistent and most improved player this season. He had 11 points and 15 rebounds against the Wildcats, which was his third game with 15-plus rebounds and sixth double-double of the season. Northwestern coach Chris Collins called the 7-footer one of the premier big men in the conference. Other than Thompson, the production of the rest of the squad has become somewhat of a wildcard. Senior forward Marc Loving seemed to be playing at his best leading up to Sunday’s matchup, but the Toledo, Ohio, native totaled just five points on 2-of-8 shooting in 35 minutes. In proverbial “toss-up” games, players who are counted on for their performance cannot disappear, especially not at home, and especially not in the Big Ten. The Big Ten Conference has an immense number of stories of star players from years past. From Magic Johnson, Isiah Thomas and Jerry Lucas, to Glenn Robinson, Draymond Green and Evan Turner, there wasn’t a season that those players didn’t battle for a conference title. Even the Fab Five Michigan teams in the early 90s — one of the best college basketball teams in history — never won a Big Ten regular-season or tournament championship. The 2016-17 Big Ten season is shaping up to be a traditional drag-it-out, tear-them-down slugfest. The top eight teams in the conference have realistic shots at getting an at-large bid into the NCAA tournament come March. While no team is 100 percent out of the picture right now, OSU is tinkering closer and closer to the edge of no return. As it stands, No. 20 Maryland (17-2, 5-1) and No. 15 Wisconsin (16-3, 5-1) are tied atop the conference with Northwestern (16-4, 5-2) and Purdue (16-4, 5-2) trailing in third. With the parity seen throughout the conference this year, it wouldn’t be a surprise to see the Big Ten champ have five losses. The last time that occurred was 2012 when three teams were tied at 13-5. At 2-4 OSU didn’t have much room for error. 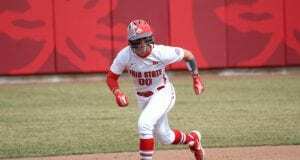 At 2-5 in a conference with immense uniformity and a deep pool of talent, the Buckeyes squandered a grand opportunity against Northwestern to gain some ground in the Big Ten standings. But sometimes, the slipper doesn’t fit. Or sometimes, in Sunday’s case, it’s fumbled and shatters when it falls out of your grasp. “I would hope it leaves a bitter taste in all of our mouths because how we played leading up to this and then to play how we play, come out (Sunday) how we came out, was just mind-boggling,” Thompson said. As last season’s Big Ten champion, Indiana’s three Big Ten losses were all away from home, and won all three games against ranked conference opponents at home. 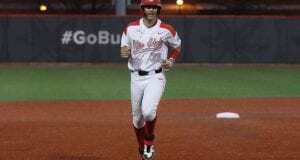 In 2012 when OSU was one of three teams that shared the conference title at 13-5 in conference, the Buckeyes lost two home conference games to ranked opponents, but won two others. The 2016-17 Buckeyes have opportunities down the road, hosting Maryland and Wisconsin. But there’s little denying that the Northwestern game was one the team had to win.